Already we are talking about high-speed, what about 400 km / h-tunnels? in my future projects already ... but I want to finish High buildings first. well, i already have most of tunnels. we need to open the new thread. I'll split this one and we'll continue here. I don't agree for track replacement, according to me current tracks are enough good. However, roads should be replaced. For example, joker roads should replace default roads. I'm not saying they are bad, only they are not consistent in graphical style. I have already 7 new tracks (50, 70, 120, 160, 240, 320 and 400 kmph) with consistent graphics. They will include snow for winter, as well. My plan is to make tunnels (entrances and underground view) for each of them: most of entrances are already done. Also bridges will match these speeds, using the consistent track (sleepers, ballast, track). I planned to use all (or most of) existing bridges, with a few needed changes and paint new ones for high speed, one tile wide, and including elevated tracks to allow more complex design for high speed. What do you mean by consistant graphic ? 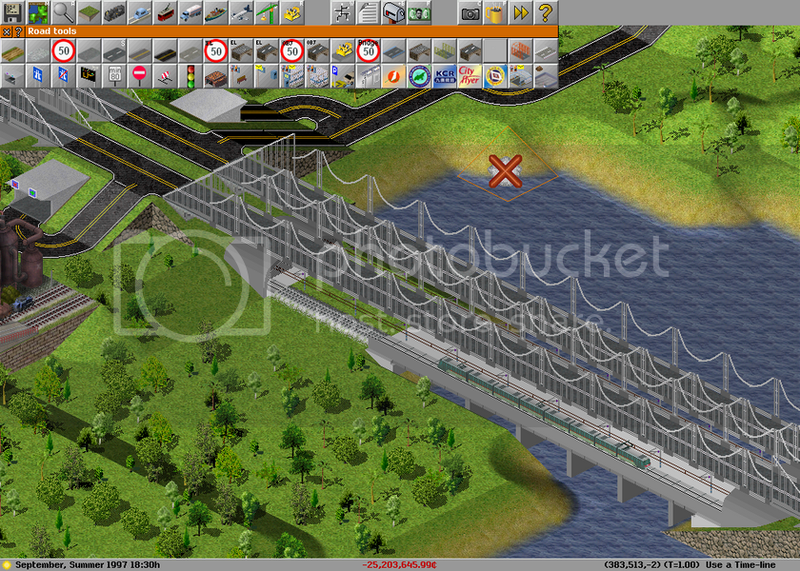 I have been creating rail bridge for speed 400 km/h too - in two versions. but less pillars. It should be for cities and with length limited to 16 tiles. It shoud be mainly for country ways and less limited length - but with pillars, of course. Wow that looks impressive! I might be tempted to have a go at a pak128 version. Are you making something like this? I like the idea about bridges etc. and making more types of track. How about making also a doubletrack rail? The roads are already in two directions on one square, tracks not. I'd really appreciate that. Same with trams, but that is far complicated. Another idea was improving the crossings of rails- now the T connection looks like this: I>-. Sometimes only one-way connections could be used, like this: I\_ Actually it is of no use, it only looks more realistic. The signals will not work well with double track railways (they'd always affect both rails). wow , I like, I want one ! Where did you download? but I have been preparing one side platforms station for some time. They are not perfect - but it is my the first playable deed. I am not right person to help you due to I am beginner in creation of graphics for Simutrans too - but in case of this bridge I see that road should not be curved (bowed). In game it could give very strange effect - because cars of all sizes and shapes would go through road. In game it could give very strange effect - because cars of all sizes and shapes would go through road. The visual effect would more resemble the cars doing a slight curve, or circle segment on the bridge. But they wouldn't be clipped from below. Unfortunately I'm not sure the sort of bridge you drew will work well in simutrans (it's a very nice bridge, just it won't fit nicely onto one tile!). Here's a preview of what it would look like, but as you can see, the shape is very distorted for it to fit to a road tile. Unless the code can be changed to allow bridges to be made of several different images in length, then there's not much else I can do with it I'm afraid. The curve isn't much of a problem. The problem is that your bridge looks good long and thin, but to fit on a tile it must be the same length as width (problem of the game, not your graphics). First I think a 320 or 330 km/h rail should be added. Can be created : a 280 km/h bridge (I have ideas for it) and 320/330 km/h bridge for the new rail. _ 280 km/h tunnel => nice enough, can be kept. So tunnels for all other ways are needed. They're existing only in pak128 Japan, I think we could create one per way (but nicer than the ones in pak Japan !). Do you thinks it's enough work ? ... for all trains : they rarely reach their maximum speed, the better is to make run 120 km/h trains on 110 km/h rail, they can reach 110 km/h much more quickly than 120, their speed is more stable and the traffic is more stable too. While I have problems with coverage of called bridge, I prepared own way for it and so I could finish work on that way - add crossings, diagonal parts and one tile curves. Basic parts (seen on picture of double track tunnel) and slope parts have been already done. Yes - but coverage could be slightly better shaped. Tunnels for other speeds are ready here: http://minami-fukuoka.simutrans.net/english/addon128/double-track_tunnel.html. They are doubletrack tunnels but one for speed 450 km/h doesn't fit well - mainly on track for speed 400 km/h. Else replacement is needed on electrification - one for speed 400 km/h does not fit on other ones - because electricity carrying wire is higher than on electrification for speeds 110 and 280 km/h - and upper electrification for speed 160 km/h is needed too (this I called in topic Upper electrification - http://forum.simutrans.com/index.php?topic=1486.0). they are only two speeds and they don't fit to a way. New (alternative) track for speed 160 km/h and one new bridge (for 400 km/h but with track for 160 km/h - so max speed could be changed). I hope called two graphical bugs on way are all. hum I'm not mad ... your tracks are red ...? in the last picture shows a small graphical error Can you fix it? What is your opinion on the first picture, looks better with some lines separated as the yellow box, or as they are in the red?